1. John Munroe, b. 10 Mar 1666, Lexington, Middlesex Co., Mass. 2. Martha Munroe, b. 2 Nov 1667, Lexington, Middlesex Co., Mass. 3. William Munroe, b. 10 Oct 1669, Lexington, Middlesex Co., Mass. 4. George Munroe, b. 1672, Lexington, Middlesex Co., Mass. Family 2 MARY BALL, b. 1652, Watertown, Middlesex Co., Mass. 1. Daniel Munroe, b. 12 Aug 1673, Lexington, Middlesex Co., Mass. 4. Mary Munroe, b. 28 Jun 1678, Lexington, Middlesex Co., Mass. 5. David Munroe, b. 6 Oct 1680, Lexington, Middlesex Co., Mass. 8. BENJAMIN MUNROE, b. 16 Aug 1690, Lexington, Middlesex Co., Mass. In 1652, Captain John Greene arrived in Boston harbor in his ship the John and Sara. He carried a cargo of trade goods from London including "ironworke," "household stuffe & other provisions for Planters" but was also carrying 272 Scottish prisoners from the Battle of Worcester, where Oliver Cromwell's Parliamentary forces had crushed the royalist army of Charles II and ended the English Civil War. The Scotsmen, many Highlanders pressed into service by their clan chiefs, fought throughout the spring and summer to defend Scotland and the newly crowned King Charles II against Cromwell's invasion. Charles, hoping to regain the English throne, pushed his army south towards London pursued by Cromwell. Finally his troops, exhausted, stopped at the town of Worcester where, on September 3, 1651, Cromwell overtook them. Four thousand Scots were killed and 10,000 more were captured. The King escaped to exile in France. Thousands of Scots were "driven like cattle" to London. One witness described the convoy: "all of them stript, many of them cutt, some without stockings or shoes, and scarce so much left upon them as to cover their nakedness, eating peas and handfuls of straw in their hands which they had pulled upon the fields as they passed." Many more died at temporary prisons while the Council of State decided what to do with them. In November, 272 were herded aboard the John and Sara and sent to the New England, where they were sold as indentured servants. Among them was "William Munro." Two of his daughters would later marry sons of Scotsmen trasported on the same ship. As "Scotchmen," they occupied a distinctly inferior rung of the social ladder, ranked with "Negroes" and "Indians" in various laws passed by the General Court.11 Scots were not only defeated enemies; they were foreigners who spoke a strange language (Gaelic, or a heavily-accented Scots English), and their religious leanings were suspect (Presbyterian, if not outright papist Catholic).12� They could not have felt entirely welcome in Puritan Massachusetts, despite the demand for servants in a labor-scarce economy. William Munroe first served millwright John Adams in Monotony (now Arlington, Mass.) and later worked for and rented land from Joseph Cooke of Cambridge. This must gave been around 1660, for another source says he settled in the northeasterly part of Cambridge Farms, now called Lexington, then that part of town called Scotland. In 1665 he married Martha George whose father was in trouble with Puritan authorities for starting an illegal Baptist church in Charlestown. She died leaving him with 4 young children and he married 20 year old Mary Ball. He and his sons eventually owned over 100 acres in Cambridge Farms (now Lexington). He was made freeman in 1690 and on 1 Feb 1699 was received into communion with the church there. In 1694 he was a selectman of Cambridge and held other parish offices as well. Savage says: WILLIAM, Cambridge, in the part now Lexington, freem. 1690, by w. Martha had John, b. 10 Mar. 1666, Martha, 2 Nov. 1667; William, 10 Oct. 1669; and George. By sec. w. Mary, he had Daniel, b. 12 Aug. 1673; Hannah; Elizabeth; Mary, 24 June, 1678; David, 6 Oct. 1680; Eleanor, 24 Feb. 1683; Sarah, 18 Mar. 1685; Joseph, 16 Aug. 1687; and Benjamin, 16 Aug. 1690. He d. 7 Jan. 1717, call. 92 yrs. old. It has been conject. that he was a prisoner, tak. by Cromwell at [] the decisive battle of Worcester 1651, ship. in Nov. to be sold here, where the 272 unhappy men arr. in May foll. but I see little reason for the conject. exc. that Hugh, John, Robert, and ano. without bapt. name, all Monrows, form. part of the sad freight. See Geneal. Reg. 378, 9. Of his ds. Martha m. 21 Jan. 1688, John Come of Concord; Hannah m. 21 Dec. 1692, Joseph Pierce, as his sec. 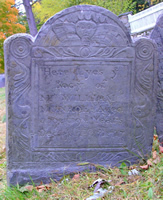 w.; Elizabeth m. a Rugg; Mary m. perhaps, a Farwell; Eleanor m. 21 Aug. 1707, William Burgess of Charlestown; and, Sarah m. a Blanchard.